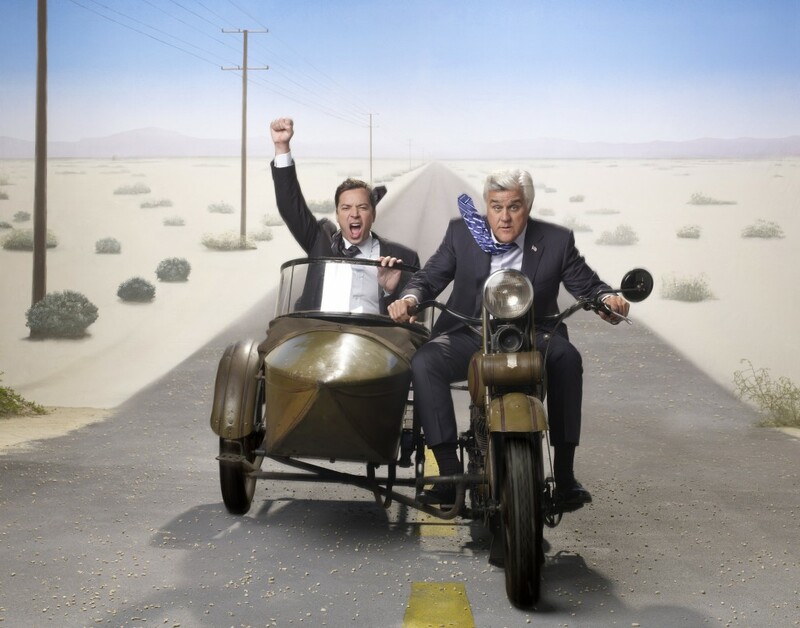 Leno and Fallon riding off together. Jimmy Fallon is the Tonight Show’s 9th host, inheriting the number 1 late night talk show from Jay Leno. Despite Leno’s strong ratings, 22+ years as permanent and guest host, loyalty, and ability to glad hand affiliates and advertisers, Leno’s lack of appeal to younger demographics was a weakness he could not overcome. Compared to recent Tonight Show hosts, Jimmy Fallon’s raise to its chair was quick and smooth. Undoubtedly due to the rough hand-off between Jay Leno and Conan O’Brien, NBC (and, I assume, Leno) wanted a transition without bitterness and dissent. To that end, Fallon worked on his late night persona for five years and kept Late Night with Jimmy Fallon an edgy, youth-relevant program while Leno kept The Tonight Show tops in late night. Fallon’s Tonight Show began February 17, 2014, during the second week of the Sochi Olympics, and the first few weeks of The Tonight Show Starring Jimmy Fallon have gone spectacularly well for NBC and its partners. Ratings for The Tonight Show have never been higher (including youth-skewing demos) and critics have been much kinder to Fallon’s Tonight than Leno’s. Jimmy Fallon’s likability factor is strong and his resume, which includes skills as comedian, singer, actor, and musician is certainly important as The Tonight Show was — and is — thought of as a variety show. His first major television break was with Saturday Night Live (1998 – 2004) but he’s also appeared in over ten movies, hosted several award shows (Emmy and MTV Awards), and of course was the host of Late Night with Jimmy Fallon from 2009 – 2014. Most notably, as a long-time New York native, Fallon moved the Tonight Show from Burbank, CA and back to its New York, NY roots.